For over a decade Mac power users have dreamed of an "xMac", a cheap bare bones Mac tower that users could buy and customize however they wanted. Its been clear for years that Apple has no interest in building such a device, as evidenced now by the "New Mac Pro", in its tubular design that pays homage to the much beloved G4 Cube. Usually that left Mac power users opting for whichever pro tower Apple was currently shipping, be it a Power Mac or a Mac Pro. But with the new Mac Pro we are seeing a different trend. The Mac Pro line is no longer the best choice for power users of all sorts. In many ways it truly is the first "pro" Mac targeted directly at users of pro apps like Final Cut Pro X.
I've been a Mac tower user for almost 10 years. I used a Power Mac G5 for over 6 years, and I'm at over 3 years on my 2010 Mac Pro. 3 years can be a long time for a computer of any sort, but one thing I love about the Mac towers is that they tend to remain useful for quite a while. Part of that is their expandability and upgradability. You can add all sorts of new gizmos and gadgets to a Mac tower, including hard drives, graphics cards, tons of RAM, PCI cards, etc. I upgraded my G5 a few times, and now I am in the process of extending my Mac Pro's life as well. The key for me in deciding to upgrade my current Mac Pro rather than buying a new one was realizing that this Mac Pro is already my "xMac". It already has everything I want (and you can't beat the price)! Tons of internal storage. A fast processor. Lots of RAM. What it doesn't have, though, is a modern graphics card and fast PCIe internal storage. The main differentiators on the new Mac Pro (other than being the first Mac tower to have Thunderbolt or USB3, of course) are its incredible standard dual GPUs and blazing fast storage. Those happen to be two of the easiest upgrades to add to an existing Mac Pro, so I decided to turn my xMac into a New Mac Pro. Once you compare cost of upgrading versus buying a new one, the decision becomes pretty easy. The new Mac Pro I would buy from Apple would cost around $6000 dollars. That gets you a 6-core processor, 1TB PCIe SSD, 32GB of RAM, and the D700 graphics card. And that doesn't include any of the additional cost of purchasing Thunderbolt enclosures for my existing internal SATA hard drives (another $700+ dollars). Not to mention a new keyboard and another DVI adapter. Alternatively, the cost of adding a 1TB PCIe SSD to my Mac Pro is $1400. Internal storage speed is one of the weakest links in the old Mac Pro, and OWC's Mercury Acceslsior solves that problem in a very elegant way. It also adds fast eSATA connectivity as well. Upgrading the Mac Pro's graphics to a modern Nvidia GTX 780 is around $500. It wasn't always the case, but thanks to modern graphics drivers and recent OS X updates PC graphics cards are now plug-n-play in recent Mac Pros. The GTX 780 actually performs about as well as the D500 and D700 in the new Mac Pro, as can be seen by some of the recent benchmarks. Its a bit of an apples to oranges comparison, since the 780 is a gaming card, and the FirePro cards are workstation cards designed for maximum compute power, so it really depends on your application for which will perform better. I haven't ordered the graphics card yet, but I've received and installed two PCIe SSDs from OWC. I installed them in a RAID-0 stripe configuration for maximum read and write performance over over 1000MB/s. Mac Performance Guide has an excellent review and guide for how to do this. Its also worth noting that when I move away from the Mac Pro to something else, I can bring these two ridiculously fast SSDs along with me! The two apps I use the most for my work are Aperture and Xcode. I'm an avid nature and wildlife photographer and a part time freelance sports photographer. I'm also an iOS developer. Both of these tend to be fairly computationally demanding jobs, so having a good system is certainly of high value. 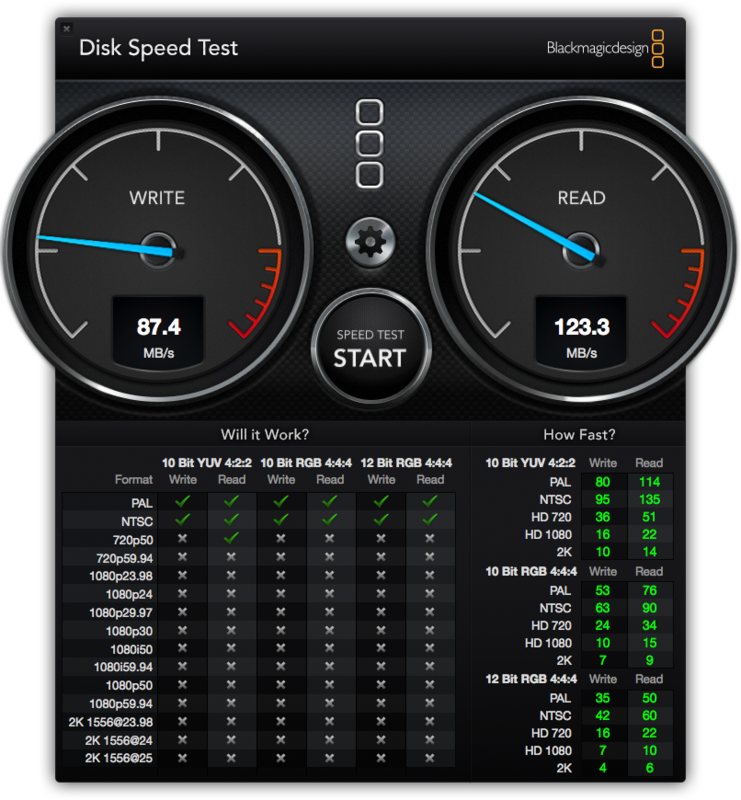 I came up with a set of basic tests for both apps and ran them on my 3.2GHz 2010 24GB Mac Pro with its old SSD (OWC Mercury Extreme Pro 3G) and with the new PCIe SSDs. I also ran the tests on a 2.4GHz 2012 16GB Retina MacBook Pro as a control. First, the speed test. Here's the original OWC Mercury Extreme SSD in the Mac Pro. The results from this SSD really are not that impressive. Its entirely possible that this SSD is nearing the end of its life, though I have no way to tell. Its an older generation SSD which is no longer sold by OWC. Here's one of the OWC Mercury Accelsior PCIe SSDs. Wow. Thats a huge difference! More than 5 times faster. But thats only one of the PCIe SSDs. What about when you put two of them together in a stripe? WOAH! Thats almost twice as fast as a single drive, and almost 10 times faster than the old SSD. Thats a pretty serious upgrade in performance right there. One quick note about striping. A RAID stripe can be a bit dangerous because of one drive fails, then the whole array fails. That makes it absolutely critical to have a reliable backup strategy. I use a combination of SuperDuper clones, offsite backups, and Backblaze to keep my photo library and data safe. If you're thinking about building a storage setup like this, please please please make your backup strategy a top priority! And finally, here's what the MacBook Pro's SSD looks like. 400MB/s is very fast storage. And this isn't even a 2013 retina MacBook Pro, which also includes super fast 600MB/s+ PCIe storage. Apple's latest Macs are very impressive. This upgrade is all about getting the older Mac Pro up to the same level of whats possible with the latest hardware. My typical workflow with Aperture is simple. Import a set of photos into a new project. Organize, rank, and edit those photos. Then export them to send to a client, post on 500px, etc. So I built a basic test suite around those tasks, similar to what I did to test my original SSD nearly two years ago. For this test I imported 866 RAW images shot with a Canon 6D and 7D at the Formula 1 Grand Prix here in Austin Texas. 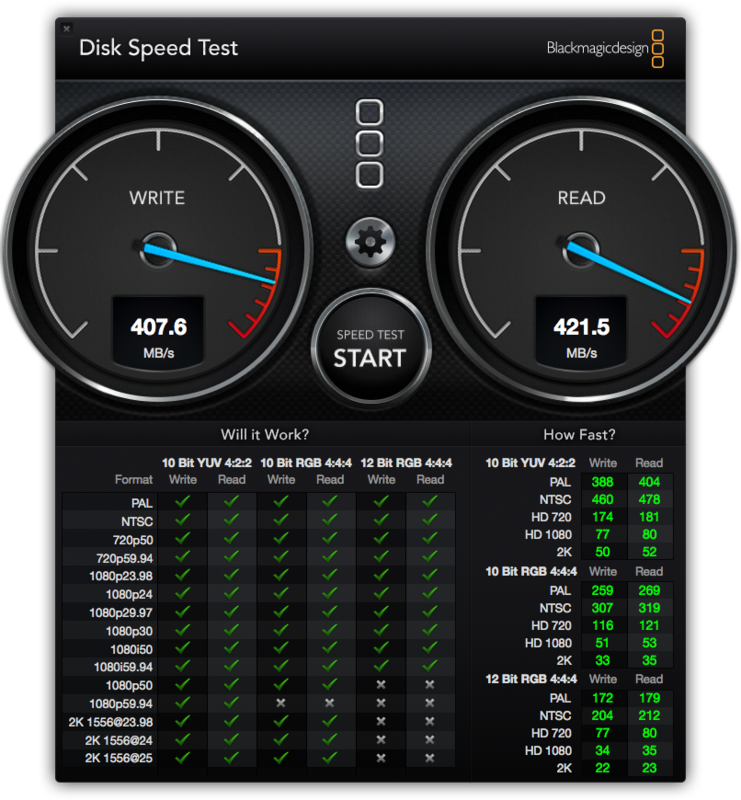 The new PCIe SSD definitely helped, representing a 20% improvement for the Mac Pro. However, the Retina MacBook Pro still won in this test. If I had to bet, I would guess that the reason is due to the superior memory throughput of the rMBP, though I do not know for sure. For this test I forced Aperture to re-generate all 866 of the JPEG previews for the RAW files from the Formula 1 race. You can force preview generation by holding down option when selecting the "Update Previews" command in Aperture. I added a 4th comparison for this test, placing the test Aperture library and photos on an internal 4TB RAID Mirror that represents my photo archive. That volume experienced the slowest results. In this test the new PCIe SSD volume made a huge difference, besting the others by nearly a full minute. JPEG image export with Aperture is a strange test. Its not immediately clear what helps improve the results on this test, but my hunch is graphics. The CPU is almost never maxed out on this test, but graphics RAM, and system RAM, usually is. I was curious what impact, if any, fast storage would have here. For this test I exported all 866 images as full original quality JPEGs. 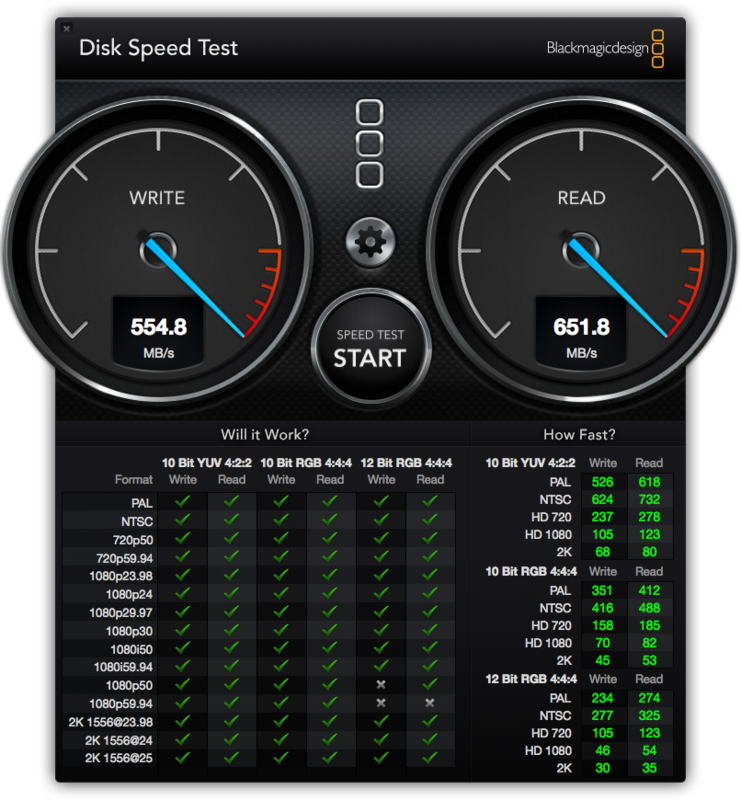 The MacBook Pro won again, but the SSD upgrade did make a bit of a difference. This marginal gain is about what I was expecting. I'll be more interested in the results of this test after completing the graphics upgrade in the near future. I ran a few other informal Aperture tests. In my original SSD Aperture test last year I tested how long it took to load all photos and all projects. Starting up Aperture on the SSD took 10 seconds. On the PCIe SSD thats cut down to 3 seconds. Loading all photos took 12 seconds on both an SSD and a HD. Well, guess what, it took 12 seconds on the PCIe SSD as well. Loading all projects, however, was dramatically faster. On the original SSD it took a very perceptible 8 seconds, but on the new PCIe one it was a barely noticeable 1.85 seconds. These changes don't show much except that to point out that a very fast random access volume makes a perfect storage system for an Aperture (or I assume Lightroom) library to sit on. Browsing through projects and images is extremely quick because the database lookups are so fast. Thats one reason that these PCIe SSDs are game changes for the server industry, and why I feel like they will improve the responsiveness of my computer by a good bit. The only real test I could think of for Xcode was how fast does it produce a clean build of a project. For a test project I selected a fairly large and complex project I've been working on. It includes well over a thousand source files, several third party libraries that are built from source, plenty of assets to copy over to the bundle, etc. Here's the results. Thats a pretty nice boost with the new SSD! Almost 6 seconds off a 30 second build. Informally I decided to boot up off of one of my backup volumes to see how this test ran on a spinning disk. One minute and 3 seconds! Fast storage seems to make a pretty big difference as far as Xcode compilation performance is concerned. The last test I ran is the 'Real World' Photoshop speed test that can be found here. The test uses a test photo of an eagle and runs a series of photoshop actions on it. Photoshop very clearly benefits from super fast storage that it uses as a scratch volume. I didn't run any formal gaming benchmarks, but I did fire up a few games to see if there was a perceivable difference. Level loading performance felt much faster, and on the few games I have that can display a frame rate, I was noticing 10-20 fps higher than I typically do. That was on the same medium-high settings that I am accustomed to on the older Radeon 5870 graphics card.